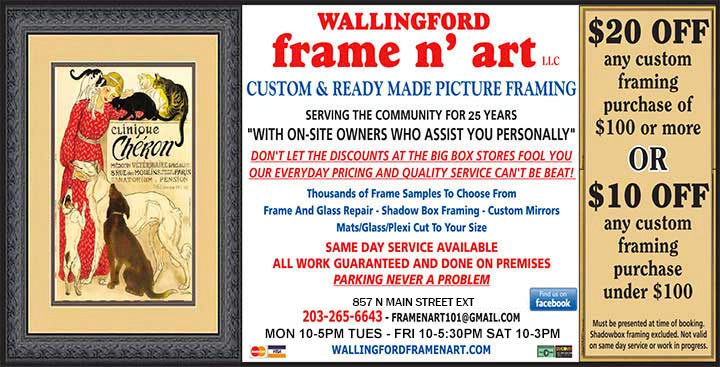 WallingFord Frame N' Art is locally owned and owner operated. Having been in business in Wallingford for 27 years we take great pride in our expert designing and finishing. We offer a large variety of services to our clients. All materials used in our shop are archival. We stretch canvas - do needleart framing - custom frame mirrors - frame sports jerseys of all types - and do shadowbox framing for all our clients special mementos. You name it and we can frame it. Not sure what to do - you can even leave your art with us and we'll pick out all the framing for you - and you'll be surprised with the finished product. You are guaranteed true personalized service. 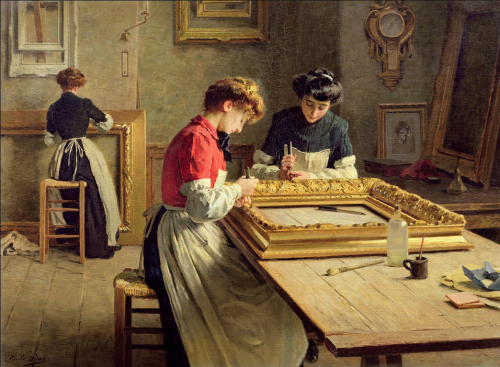 Wood frames, glass (clear, non-glare, conservation & museum), plexi-glass and mirror are cut on site to your specifications. You can bring an old frame in - if we can repair it - we will - we're not hard sell - if you're not looking for new we'll fix your original frame. Looking for same day service - not a problem , we stock a large variety of wood molding that can be cut to your size as well as a huge selection of mat board colors in stock and ready for your immediate needs. Ready made frames starting at 5 x 7 and up are also available. 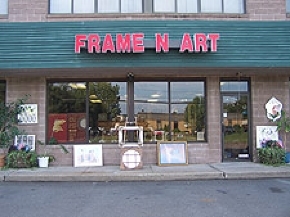 Wallingford Frame n Art is open 6 days a week for all of your framing needs. Since we are on-site owners you'll be assured to have the utmost in personalized service available. Stop in and browse our vast selection of custom moldings. Customer service satisfaction is our number one priority. We value your business and will go the extra mile anyway we can. We now have a new "unique" gift shop inside our gallery. Stop by and browse our selection of "one of a kind" items. Clocks - Mirrors - Frames - Cards - Candles - Lamps - Wind Chimes - Framed Art - Prints and Posters, plus much more. You'll find everything to be affordably priced. Interesting "finds" being added weekly. Make us a "must stop" destination this spring. 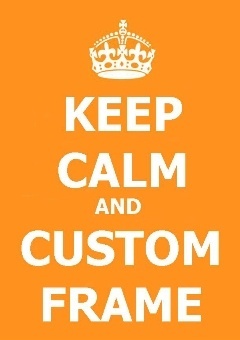 CLICK HERE TO DOWNLOAD OUR CUSTOM FRAMING COUPON. 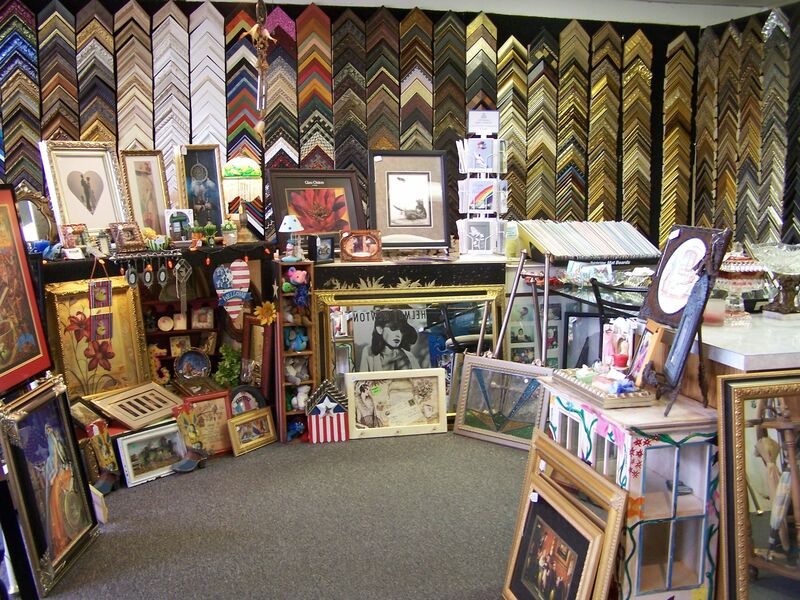 Our gallery has thousands of frame samples on display (probably the largest in our area).Since you will be working with the owners you're sure to be completely satisfied with our expert knowledge of the framing industry. We guarantee complete customer satisfaction, quality and affordable prices. All framing is done on premises. We are also offering a unique selection of small gifts and MINI MADES in our gallery for special occasions. MINI MADES are small frames with unique pictures - each is a one of a kind. They make great teacher gifts, stocking stuffers, house warming gifts, or they are great to just prop up in your special spot. You really must see them, and the price is right!!!! We also have a nice selection of specialty style mirrors of different shapes and sizes. There is always something new in our gallery - you must stop in and browse. You'll be surprised with the selection of items we have to offer. We also specialize in custom mirrors - we can design a mirror (beveled or regular) in any shape either rectangular or square. You can take frame samples home to see how they will work with your decor. Looking for oval or circle frames - we have at least 50 different sample styles that are available in a variety of sizes. Just ask us to show these samples to you. CLICK HERE TO FOLLOW US ON FACEBOOK !!! YOU CAN SEARCH FOR PRINTS BY MANY DIFFERENT FINE ART CATEGORIES OR YOU CAN CHOOSE TO LOOK AT PRINTS DEDICATED TO A SPECIFIC ROOM IN YOUR HOME. INCLUDED INSIDE THE TUBE WITH YOUR NEW ARTWORK WILL BE A COUPON FOR 15% OFF CUSTOM FRAMING. AND, IF YOU HAVE YOUR ORDER SENT DIRECTLY TO US THE SHIPPING IS FREE.